It's not a large woods, dark and deep – it's just the two-acre parcel located just north of Wilhelm's Portland Memorial Mausoleum on S.E. 14th Avenue in Westmoreland. It's for sale – it has been, for a while – and it shouldn't be sold to developers, neighbors say. Although the management and policies of the venerable local funeral home have not changed, its relatively new owners – "Foundation Partners" of Orlando, Florida – listed the vacant property for sale when they acquired it as part of their purchase. 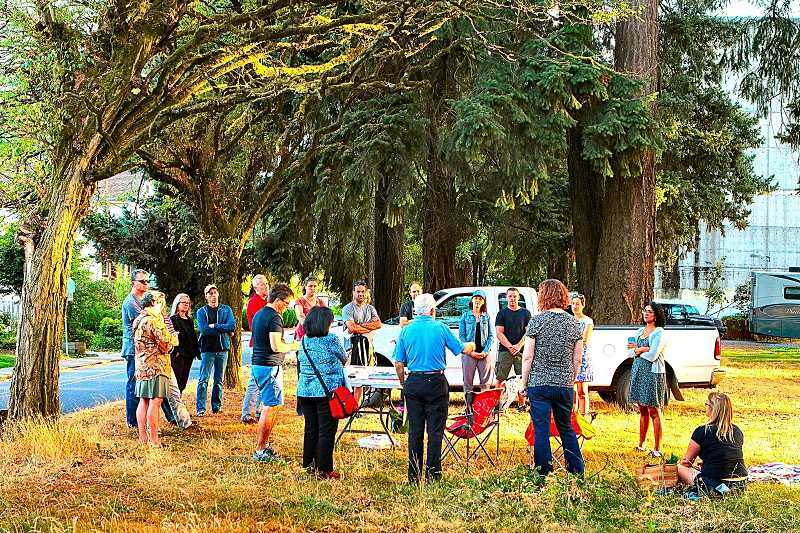 "It is a beautiful asset for the community, because it has open space that is connected with Oaks Bottom," explained Westmoreland neighbor Amrita Vatsal, who was leading a meeting on the site, on Wednesday, September 13. "It's right next to Llewellyn Elementary; it's a roosting space for bald eagles and osprey; and it could be a wonderful place for people to come and enjoy the open space and the twenty mature conifer trees on the site. "We have a once-in-a-lifetime opportunity to make this lot a park for Westmoreland, and create potentially an asset for Llewellyn Elementary School in the future," said Vatsal. In this case, there is a "willing seller", Vatsal observed, and perhaps they could be motivated to sell it for such a use in the neighborhood for perhaps $1 million. "We're asking people to contact their elected officials, Portland Parks & Recreation, Portland Mayor Ted Wheeler, and Metro, to let them know that there is significant interest in the community to purchase this property – and the community will work with them to make that happen," said Vatsal. Interested people can learn more at the Facebook group or Google Group called "Moreland Woods", Vatsal told THE BEE.